This change has filled her sails with a wind that she herself defines as “wild”… Today it’s hard to actually stop the flow of her words and enthusiasm, regardless of agreement or disagreement with her positions. It is impossible not to be impressed by her conviction. “In 2009,” she says, “we talked about social justice. It was our vision, but it wasn’t relevant to the public’s consciousness at the time, and this was also reflected at the polls. Yet the protest of summer 2011 brought a change. As long as people here were not really suffering, they were not looking for solutions. But when the shock waves started in Europe and the Arab world, they arrived in Israel too. A lot of people got courage to speak out; each one’s private problem became a collective issue of social justice. “I didn’t know it would happen so fast. It’s very exciting. I’m glad to be part of it. I’m part of this and happy that I made the right investment in social justice. The role of the party that wants to lead this is to look ahead. I have a vision and it wasn’t clear to people—to talk about Jews and Arabs, about socialism, social justice. They thought I was dreaming, that all Arabs hate Jews and all Jews hate Arabs. And I know that’s not true. At a certain point, because reality is crushing you, because it empties your pockets and kills your children, you start to think. When Muhammad Boazizi set fire to himself, the flame burnt down all the barriers and walls after 40 years of deadly silence in the Arab world. Agbarieh-Zahalka was born in Jaffa 39 years ago, the scion on her father’s side of a large family from Umm al-Fahm. During adolescence her religious faith grew and she joined the Islamic Movement. In 1995, while she was studying at Tel Aviv University’s Faculty of Humanities, the Da’am party offered her a job as editor of the Arabic newspaper, Al-Sabar. When she got to meet the party activists, she was surprised to hear Jews speaking fluent Arabic; gradually she underwent a change, joining the party and eventually becoming its leader. In 2006 she was the only woman who headed a party for the Knesset. In 2009, she was joined in this respect by Tzipi Livni; in 2013, she stands beside Livni, Shelly Yachimovich and Zahava Galon, four women leading political parties. For Asma, however, this fact does not create solidarity or identification, just as she rejects any attempt to find similarities between herself and Hanin Zoabi, Balad MK. 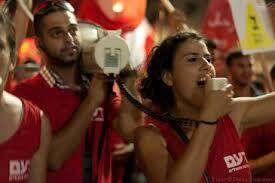 “The Arab party Balad is nationalistic and bourgeois; it’s not a political party that espouses social justice. I do not compete with Hanin Zoabi. Hers is not the public I seek. I appeal to the 50% of the Arab population that is tired by the political options the Arab parties offer. Arab parties advocate a nationalist discourse, dealing only with the national question, neglecting the socioeconomic questions and the hardships suffered by the Arab public. Gaza and Tel Aviv amount to one issue. The political has to go along with the social. There is 50% poverty in the Arab street; 80% of women in the Arab sector don’t work. That is a catastrophe. Is this a people that can think about freeing Palestine? This is a people that must first free itself. And the point is not expressed by anyone. The fact that you and Zoabi are Arab women going against the current doesn’t seem to you like a thing that can bring your agendas closer together? “It’s not enough to be a woman. Shelly Yachimovich is a woman too. So is Tzipi Livni. Being a woman is good, but it’s not enough. It is also not enough to be an Arab. Bashar al-Assad is an Arab too. I want to turn cultural diversity into a force, and Zoabi makes it into a wall separating people. I do not want people to vote for me because I am an Arab. That’s not the ticket I want. The question is, ‘What kind of Arab are you?’ I stand for class identity. I think that class identity is much more correct in places like Israel, which are saturated with different sectors and with an ingathering of exiles, including Arabs. What could connect and advance people, I think, is the daring to get out of sectarianism, to get out of the ghetto. And Zoabi is stuck in the ghetto, isolated and differentiating. What do you think about Zoabi’s boarding the Marmara? You say that there is readiness to accept your ideas in relation to class consciousness, but what about racism on both sides? Do you think that today Jews or Arabs are ready to vote for an Arab-Jewish party? “I probably will not be Prime Minister. Not all of the public will vote for me. As for the public that insists on racism—I’ll wait for them. I will continue to believe, just as I believed that the time of social justice would arrive, that understanding would ripen, so I believe that the time will come when people will outgrow racism. I also believe that some will follow racism to the end, to fascism. I’m not naive. But racism is a form of false consciousness in which you think you have privileges as a Jew in Israel, but actually you don’t. Today this country is a state of the rich, not a Jewish state. To whoever understands this and experiences it in their pockets, in their refrigerator, in the cost of living, in their ability to make ends meet, to whoever has experienced it in everyday life, I suggest that they stop blaming the situation on the Arab, but rather blame the policy that is made in their name as a Jew, and they should simply change the diskette. You really think you can make them think otherwise? At least wouldn’t it be better to change the name to something that didn’t sound like an Arab political party? It seems that you have no separation between politics and your personal life. Agbarieh-Zahalka laughs. “Yes, someone pays a price, my son Adam and my spouse Musa. But there’s nothing I can do about it. At the age of 22, I decided that I would not live well while people around me were sinking. I could have, but I chose not to. One cannot survive without the people around one. So I am drawn to this matter. My child will not grow up in a society that exploits its workers and destroys the people within it. That’s not why I brought him into the world. I accept the fact that I brought him into a world where I would prepare a normal environment for him to live in. I’m not doing it for me, but for him. Categories: Da'am Party, New left in Israel, Uncategorized | Tags: Abu Mazen, Al-Sabar, Arab Spring, Asma Agbarieh-Zahalka, Da'am Workers Party, Hamas, Haneen Zoabi, Hezbollah, Marmara, Michal Schwartz, Mizrahis, Nakba, Naksa, Organization for Democratic Action, Our Way to Fight, Rothschild Boulevard, Wafah Tayara, Workers Advice Centre | Permalink.